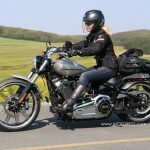 The 2018 Harley-Davidson new touring bikes lineup introduces the most robust array of custom touring motorcycles the company has ever produced, boasting show-stopping style and plush comfort ready to attack rough city streets or winding country roads. Three new completely restyled Touring models enter the limited-edition Custom Vehicle Operations family with the largest-ever stock engine from Harley-Davidson, while new Street Glide Special and Road Glide Special models get sinister, blacked-out styling. The CVO tradition of giving customers the ultimate in Harley-Davidson styling, innovation and performance continues in 2018 with the CVO Limited, the CVO Street Glide and the CVO Road Glide models. Each model offers its owners a fully customized, limited-edition motorcycle straight from the factory with a two-year unlimited warranty. Starting with the largest stock engine displacement ever offered by the Motor Company, and available only in CVO models, all three bikes have upgraded Screamin’ Eagle power and exclusive bragging rights with the Milwaukee-Eight engine in a new 117-cubic-inch displacement, rated at up to 125 ft. lbs. of torque. Also new for all three CVO models is an advanced integrated communication technology that features a wireless headset interface module. Customers can use the included Bluetooth headset to communicate with the motorcycle Infotainment system, their passenger and other riders. Custom touring loaded up with Harley-Davidson’s most powerful engine and sound system ever offered straight from the factory. Powered by the new Milwaukee-Eight 117 (1923cc) engine and given the full-on custom treatment fender to fender with three new premium paint schemes and matching Talon wheels and rotors. Top-of-the-line 6.5 BOOM! Box Infotainment System with Stage II speakers provides superior audio performance. To achieve the rich 900 watts of Boom! Audio sound there are three 4-channel amplifiers powering six bi-amped speakers in the fairing, fairing lower and saddlebag lids. Sinister bagger with swagger that epitomizes CVO’s new look and performance. Powered by the new Milwaukee-Eight 117 (1923cc) engine, with aggressive shark-nose fairing, three premium paint options, custom wheels and a new sleek front fender. Features the first factory-installed new 21-inch Knockout™ front wheel for Touring models from Harley-Davidson. Engineered to deliver optimal performance, handling, and ride quality without compromising fitment of accessories. High output audio from the BOOM! Box 6.5GT Infotainment System features Stage II speakers in saddlebag lids and fairing for 600 watts of pure audio bliss. A premium touring machine loaded with best-in-class power, infotainment, show-winning paint and premium rider and passenger comfort. Powered by the all-new Twin-Cooled Milwaukee-Eight 117 (1923cc) engine, dual bending valve front suspension and emulsion rear suspension with hand-adjustable pre-load, the ride across country will be smooth, comfortable and brisk. 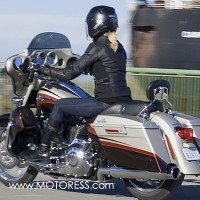 The two-up seat is suspended and heated with a custom seat cover, insert and stitching unique to CVO models and not available anywhere else, also it comes with matching adjustable rider and passenger backrests. For added safety and convenience, top it off with a power-locking key fob, Reflex linked Brembo brakes with ABS and the Harley-Davidson Smart Security System. Two luxurious color options are Burgundy Cherry Sunglo Fade and Black Earth Fade. See them in person to confirm the paint depth through its layers and how front-to-back the execution is seamless. 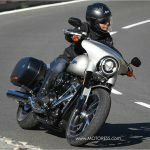 Harley-Davidson takes the wildly popular Street Glide Special and Road Glide Special models in a new design direction for 2018, swapping chrome for black. Powered by the muscular Milwaukee-Eight 107 (1746cc) engine, the two new hot rod baggers take the base level models and elevate them with an on-trend custom styling statement that is sinister in design and dark in its finishes. Dark finishes stretch from headlight to exhaust with new 19-inch (483 mm) front and 18-inch (457 mm) rear Talon wheels. 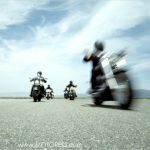 Dripping in black are the engine guard, front forks, handlebars and hand controls, mirrors, turn signals, tank console, engine covers, air cleaner cover, mufflers and exhaust shields. Custom touches that create an aggressive, modern look include the stretched saddlebags that accentuate the bikes’ long, low profile and painted inner fairings. Hand-adjustable emulsion-technology rear shock absorbers offer 15 percent more pre-load adjustment than previous* low-profile touring shocks. Front suspension features dual-bending valve suspension technology that delivers the damping performance of a racing-style cartridge fork with linear damping characteristics and reduced weight. Reflex linked Brembo brakes with ABS and the Harley-Davidson Smart Security System are standard equipment. The all-black Milwaukee-Eight 107 (1746 cc) engine offers quicker throttle response, more passing power, purer sound, a smoother ride and more of the feeling riders want from a Harley-Davidson Touring motorcycle engine. Each Milwaukee-Eight engine produces 10 percent more torque. * The Milwaukee-Eight 107 accelerates 11 percent quicker from 0-60 mph, equal to a two-to-three bike length improvement, and 11 percent quicker from 60-80 mph in top gear, equal to a one-to-two bike length improvement. * The Milwaukee-Eight engine offers improved rider and passenger thermal comfort due to reduced heat absorption, increased heat rejection and a redesigned exhaust system. For improved fit, a new, slimmer primary drive cover and the low-profile shape of the air cleaner cover provide improved rider leg room around the engine and an easier reach to the ground for many riders. All Milwaukee-Eight powered models are fitted with an assist and slip clutch with improved hydraulic actuation and 7 percent less clutch lever effort. Standard BOOM! Box 6.5GT Touchscreen Infotainment System features upgraded Stage I BOOM! speakers for deep bass and balanced sound. Road Glide Special: Vivid Black, Wicked Red, Bonneville Salt Pearl and Hot Rod Red Flake Hard Candy Custom paint. Street Glide Special: Vivid Black, Twisted Cherry, Bonneville Salt Denim and Hot Rod Red Flake Hard Candy Custom paint. To view the full lineup of 2018 Harley-Davidson motorcycles, gear and accessories, visit your local authorized dealer. *Comparison made between 2016 and 2018 original equipment Touring models.